The last couple days have been an exercise in patience. I’ve decided that I’m going to put more of my effort into improving in two competitive multiplayer games: I’m going to both try to get better at Dota 2 and Street Fighter V.
The reason I pick these titles is part convenience, part affinity. I already own both of them, I know many people who play them, and the communities for both are healthy and vibrant. My main reason for picking Street Fighter over a game like Super Smash Bros. Melee (which I’m involved with) is the ease of use when it comes to finding matches online. 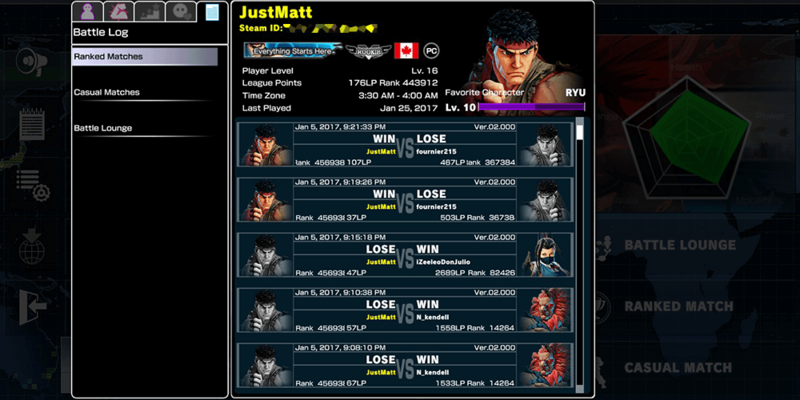 While the netplay ladder system for Melee is present, it’s not where I’d like to be, and Street Fighter tends to stream better. Currently, I have 1500 hours logged into Dota 2, which is just scraping the surface. I have a regular group that I play with that are better than me, and have done amazing things in terms of having patience. The thing is, I’d love to be more confident and less prone to panicking. All that comes with playing enough to know my capabilities and how to make decisions. I have very little experience with fighting games, but reading Patrick Miller’s awesome ebook on learning fighting games made me want to try a bit harder. Currently I’m working my way through a large amount of beginner material, starting with Gief’s Gym on Reddit (alternate link). Part of what interests me is the desire to see fruits of my labor and test myself in a one-on-one environment; most (if not all) of the games I play online are part of a team, and I find that this keeps me in a comfort zone that depends on other people. As you can see, my experience is pretty limited. Less than a couple dozen matches played. This isn’t to say that isn’t a fun place to be, but there’s something in me that’s wondering what I can do by applying myself. This is a pretty common thing with gamers; sometimes they just bomb out hard, and who knows, I might be one of them. In the meantime, I’m going to keep learning and trying to apply what I’ve learned; Mostly I’m going to be sticking to Ryu, which is stereotypical as hell for newbies, but hey, I’m about embracing who you are. Alongside all this, I’d like to keep writing about how I’m doing mostly because it’s a way to reflect and vent. I think a lot of people either would like to undertake the same journey or are doing a similar one themselves, and being able to provide that kind of catharsis is fun. I hesitated going into this mostly because announcing things tends to be a bad omen; putting expectation on these kind of ventures usually leads me to disappointing myself. I’ve blogged about my quest to get better at Dota before, which ended in a bit of a burnout due to said expectations being put on the project itself. This time around, I’d love to keep from over-complicating it. Learn, play, reflect. That’s pretty much all that this is going to be. If you’re interested, stick around.